The Dark Ranger: Slaughterhouse Third & We Win! "The King" of The Jungle always beats a Panther in a death-match, and it was proven tonight. 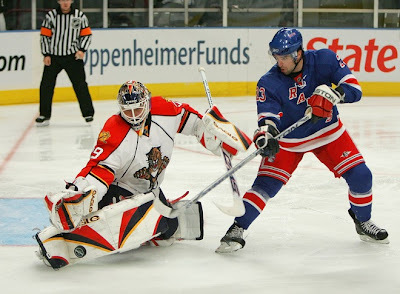 The New York Rangers took the Florida Panthers for a ride and ate their young, winning 5-2. The evening began with an unexpected and welcome appearance by our own #2, Brian Leetch - three months earlier than when the Garden will be retiring his number to the rafters on January 24, 2008. The Garden went mad! The achievements were numerous. Newcomer Chris Drury scored the game-winner and added two assists in his Rangers debut. Defenseman Marek Malik picked up three assists. Petr Prucha indicated there would be no early-season slump like a year ago, rifling home the first of the four-goal outburst. Youngster Ryan Callahan continued to build on his success last season with a beautiful goal, and goaltender Henrik Lundqvist was brilliant with 27 saves, keeping the team in the game until the third-period eruption. 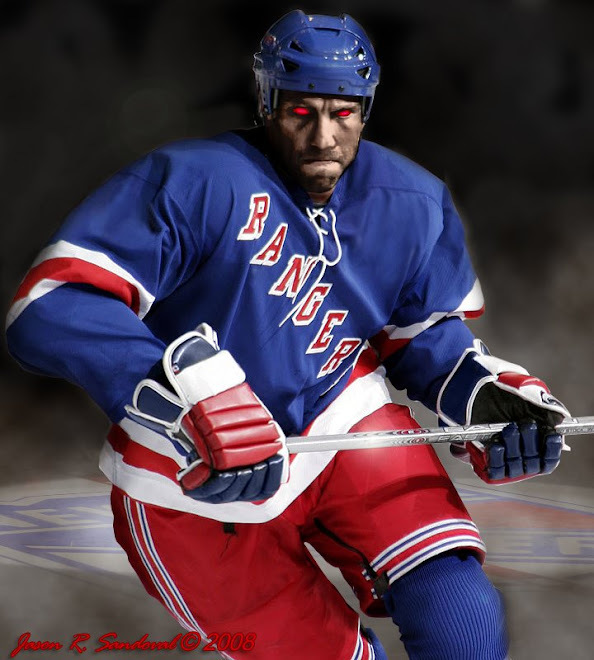 With the victory, the Rangers began a season 1-0-0 for the third straight year heading into Saturday night's first road game at defending Eastern Conference champion Ottawa. The beat writers have predicted the Ottawa Senators against the Rangers will be some of the best hockey this season and the most anticipated race in the Eastern Conference. Welcome Chris Drury, redemption for our Marek Malik, and our fourth youth-line played hard and proved to all why they were the choice prospects to place in the NHL. The Dark Ranger salutes. Bring it on, Canada. Pffft, redemption for Malik ... he still can't play defense, and two of his assists were closer to luck than actual skill. But whatever, we won!!!!!!!!!!! !